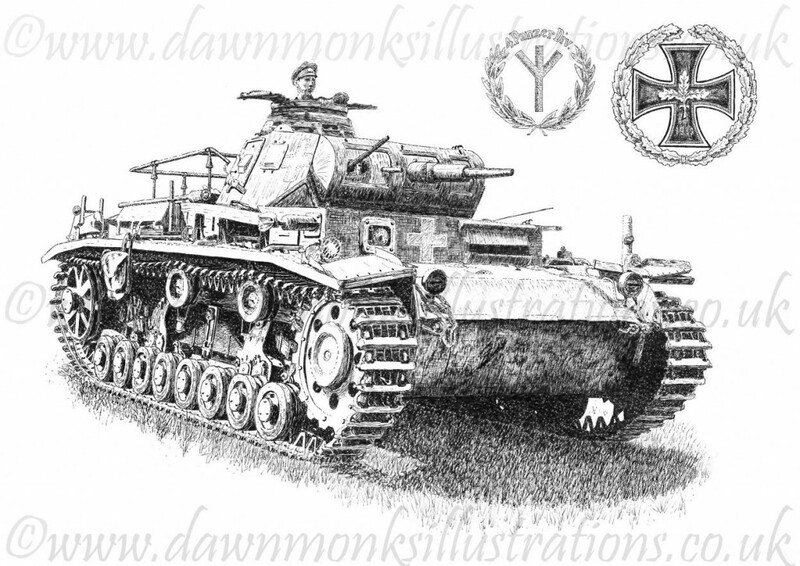 30 limited edition prints taken from an original Dawn Monks pen & ink illustration of a German WW2 Panzer III (Ausf. 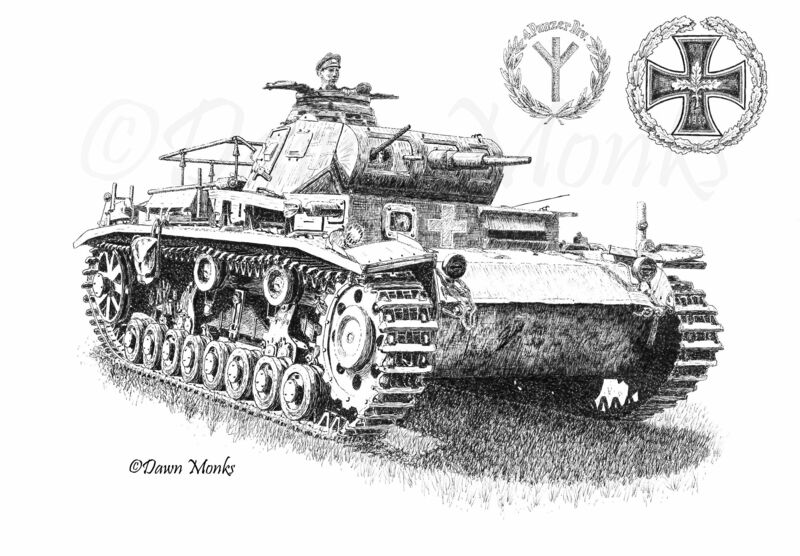 D) Command Tank, featuring the German Iron Cross and the insignia of 4. Panzer Division. Each print has been individually hand signed by Herr Wilhelm Heilmann – a German WW2 holder of the Iron Cross 1st Class who served with 4. Panzer Division – and comes with a sheet of biographical information and a signed photograph of Herr Heilmann, along with a Certificate of Authenticity. Each one of these exclusive prints has also been hand signed and numbered by the artist. These extremely limited, never to be repeated, prints – including the unique extra content – are now available to buy (unframed) at £150 each. The price of the unframed original artwork, which has also been signed by Herr Heilmann, is £700. The original artwork and prints are available to purchase through my online shop. There are only 30 of them and they’re not likely to hang around for long so you’d better get a wriggle on if you don’t want to miss out! The picture is based on a photograph that was taken in Poland in September 1939, and the original drawing is rendered in indelible, light-fast black ink using Rotring 0.2mm and 0.1mm pens on 405 x 303mm, 300g/m² Daler Rowney Langton watercolour paper. The drawing itself measures approximately 260 x 200mm. 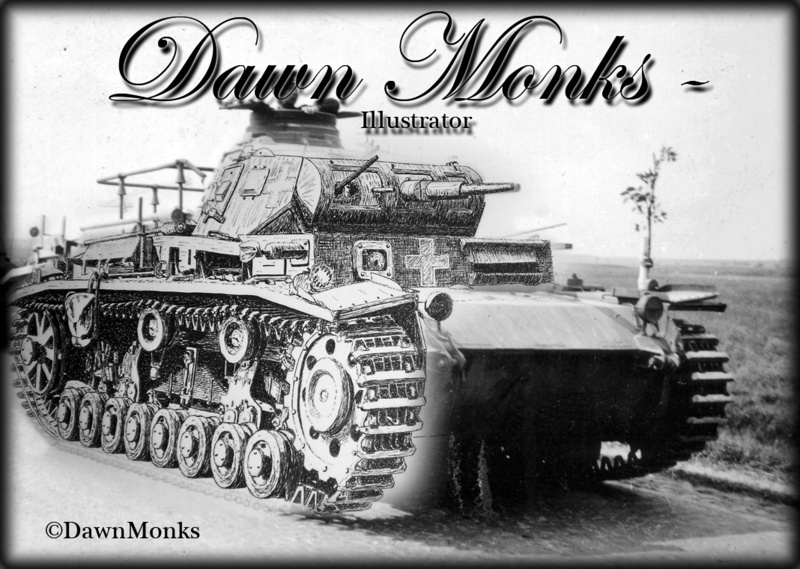 Feel free to contact me if you’d like to discuss commissioning a picture of a particular type of tank (any era) or any other military vehicle that you’ve a bit of a soft spot for.